SKIP KELSH of Bechtelsville, PA made his second try of the season in February and his persistence was rewarded with this big cat. WAYNE FETTES of Okotoks, AB didn't have far to travel to get in on his first cougar hunt. Wayne was lucky enough to get this nice tom on his first day out. BRAD OTTO of Minot, ND drove up to Alberta in February for his first cougar hunt. DON and DORIS MILLER of Alabaster, AL booked their hunt with us at the Safari Club International Convention a few years ago. Don took his fine pronghorn on the first day of their hunt, Doris' was harvested a couple days later. We had a lot of fun and made some great memories during our time together! 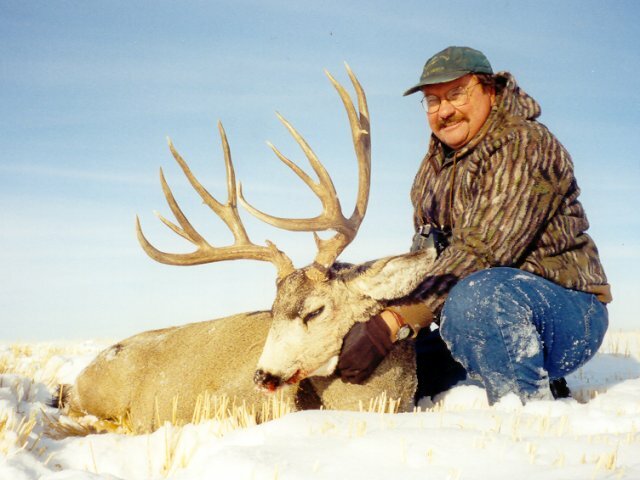 RAYMOND OELRICH of Kelowna, BC only had three days out of his busy schedule as Publisher of Big Game Adventures magazine to hunt mule deer with us. We hunted hard and high on a mountain horseback hunt. Ray took his dream buck on the last day. Check out the mass and the double drop tines. Outfitters don't get many chances to hunt their home ground. This year Gordon was lucky enough to take this nice fall bear for himself with a 140 grain Barnes X bullet from his .280 Remington. JIM MELLODY of Scottsdale, AZ returned to hunt with us again this year and took this beautiful 5X5 prairie mulie on the first day of his three day hunt. Jim was also lucky enough to put his tag on this prairie whitetail the next day. 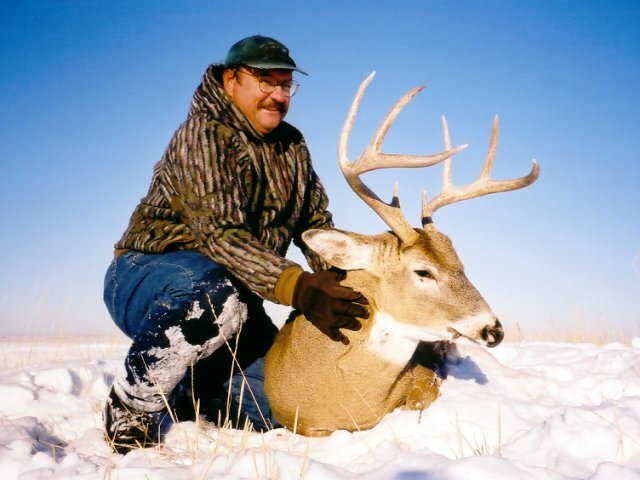 MARK KOEHLER of Layton, UT and his partner Ken are avid mule deer hunters. They met us at the Safari Club International convention where we made plans for a prairie deer hunt. Mark scored on day one on this great buck. KEN CROCKETT of Layton, UT made a great shot on the second morning of his hunt to get himself this terrific muley. DAVE POPA of Manasquan, NJ fought off a badger and hiked a few snow filled coulees before he scored on this nice muley buck. He's looking forward to coming back to find the "one that got away"! BILL QUINTANA of Bayfield, CO with his mule deer of a lifetime. Bill had to break his rule of never shooting on the first day when he stalked up on this extremely high and heavy prairie mule deer an hour and a half into his hunt! TROY EVERETT of Cedar Hills, UT had his work cut out for him when he shot this long-tined "classic" 4X4 muley along the river breaks. You can bet that both he and his guide were all smiles as they packed it out. This one makes three big muleys going to Utah hunters this season! BOB LOSS of Pittsford, NY joined his pal Bill Wilson, our good friend and client, to partake in his first mule deer hunt. As you can see he was very successful and has already planned a return trip with Bill for moose in a couple of years! BILL WILSON of Missoula, MT decided to try a prairie mule deer hunt this year (in 2001 he took a huge muley on our mountain hunt). He took this heavy buck on the last day of this year's hunt. Thanks to everyone who joined us in 2003 and made the year another memorable one for us. Congratulations to those whose success we were lucky enough to share. Cresten Andersen, Darren Daniel, Derek Barnes, Gary Villemaire, Heide Bowyer, John Gordon and Tony Kondel.